"Praise for previous volumes. . . . . .serve[s] as a text book for advanced students and as a reference for all pharmacists (and other professionals) who are engaged in this area. . .recommended to all formulators, as well as scientists and teachers, seeking for a source of quick and comprehensive information about general aspects of disperse system dosage forms. " ". . .a valuable resource with plenty of useful tips and insights. " 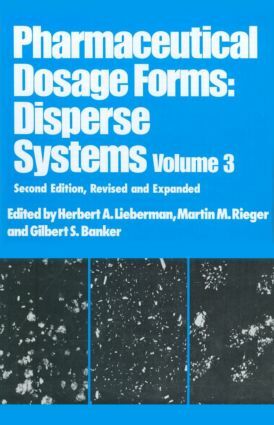 ". . .these books are indispensable for those pharmaceutical scientists involved in the development of disperse dosage forms. . .[they] will also be very helpful in teaching. . .there is no doubt that these books will serve as valuable reference books for the years to come. " ". . .recommend[ed]. . .for inclusion into a department reference library, or its use in an academic course because of its broad approach in some areas, such as polymeric coating and nanoparticle development, as well as its specific focus on certain areas such as scale-up and liposomes." Part 1 Specialized dispersed system: specialized pharmaceutical emulsions liposomes; polymeric dispersions as drug carriers; aqueous polymer dispersions as film formers; biodegradable nanoparticles of poly(lactic acid) and poly(lactic-co-glycolic acid) for parenteral administration; aqueous polymeric dispersions; polymeric pharmaceutical excipients. Part 2 Equipment, processing, quality assurance, validation, regulation: a practical guide to equipment selection and operating techniques; set-up to manufacturing; scale-up of dispersed parenteral dosage form; quality assurance; validation of disperse systems; drug regulatory affairs.